Blogging has been around for ten years or more in its current form. But even when the cavemen were writing on cave walls with rocks it was a form of blogging. Those cavemen were creating content. They were interpreting their world. For centuries that content remained and got people intrigued and interesting in the cavemen and their lives. Businesses are coming around to the advantages of creating content as a profitable way to increase sales and improve business. Research company eMarketer recently highlighted a study by HubSpot that showed the effectiveness of blogging as a way to generate sales. There is much more in the article including great info regarding Twitter. It’s worth a few minutes to read the entire article. Using a blog as a lead generation tool is a long-term proposition, but a necessary one in today’s digital world. 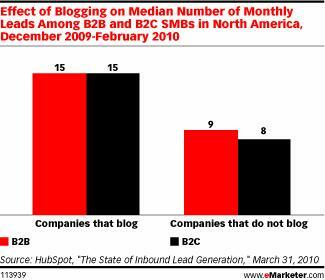 As the HubSpot studies found there is much to be gained from starting a blog. Lead generation can greatly increase the number of leads coming from your site. I like that the HubSpot study pointed out the importance of creating many pages on a regular basis. The nature of blogging makes it easier for a business website to create fresh content on an ongoing basis. Most business websites begin with the few main pages all business sites need like the home page, the about page, the services page, the contact page, and perhaps a half dozen other pages. This is all necessary content but it will struggle to pull in web users. Search engines place higher authority on sites that continuously generate new content for their spiders to crawl and index. A blog provides a platform for a business to satisfy this hunger for content. Optimizing the content on a blog will improve the chances of making sure your business is writing content for potential sales leads. Does your business want more sales leads? Has your business thought about starting a blog? What has been a sticking point on starting a blog or really giving a blog a full go with a strategy and energetic effort?